We have a new dimension in the great race to income inequality in the United States, retirement funds. The Economic Policy Institute has a new graph-o-rama analyzing retirement today. The thing that's bothersomeis we am fairly certain most people have no retirement at all beyond social security. Suspect EPI's estimates on retirement funds are conservative and the approaching maelstrom for the last of the baby boomers and younger is whipping up into a frenzy over the horizon. Retirement insecurity has worsened for most Americans as retirement wealth has become more unequal. For many groups, the typical household has no savings in retirement accounts and balances are low even when focusing only on households with savings. Retirement savings are characterized by large differences between mean and median values because mean savings are skewed by large balances at the top. 401(k)s are an accident of history. In 1980, a benefit consultant working on revamping a bank’s cash bonus plan had the idea of adding an employer matching contribution and taking advantage of an obscure provision in the tax code passed two years earlier clarifying the tax treatment of deferred compensation. Though 401(k)s took off in the early 1980s, Congress did not intend for them to replace traditional pensions as a primary retirement vehicle, and 401(k)s are poorly designed for this role. In theory, the shift from traditional defined-benefit pensions to 401(k)-style defined-contribution plans could have broadened access to retirement benefits by making it easier and cheaper for employers to offer benefits. However, participation in any employer-based retirement plan declined over the past decade even as defined- contribution plans became prevalent in the private sector. And as pension coverage declined, older households delayed retirement and increased their earned income. Think what you will about Republicans versus Democrats, Senator Jeff Sessions wrote an op-ed in USA today asking a very basic question, What is the loyalty a nation owes to its own citizens? Isn't that the bottom line here, our government is not putting American workers, first and foremost? There is an unspoken question at the heart of the immigration debate: What is the loyalty a nation owes to its own citizens? Business groups financing the push for comprehensive immigration reform believe they have the right to demand from Congress as many workers as they want from abroad at the wages they prefer. How this affects the struggling U.S. citizen is not their concern. But the costs -- human and financial -- would be enormous. 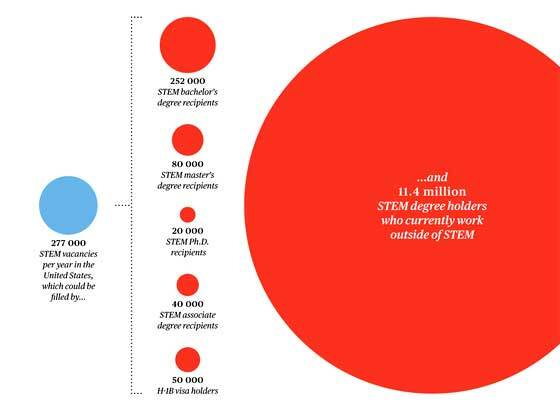 there are more STEM workers than suitable jobs. One study found, for example, that wages for U.S. workers in computer and math fields have largely stagnated since 2000. Even as the Great Recession slowly recedes, STEM workers at every stage of the career pipeline, from freshly minted grads to mid- and late-career Ph.D.s, still struggle to find employment as many companies, including Boeing, IBM, and Symantec, continue to lay off thousands of STEM workers. Bloomberg gives a blow by blow breakdown on why dervatives were not reformed. Short answer, yes the banks won again and the lone wolf holding on at the CFTC trying to implement some derivative rules is under attack by the Obama Whitehouse no less. Great graphic explaining the lobbyist barrage against the CFTC. One by one, Gary Gensler’s supporters deserted him. Now the chief U.S. regulator of derivatives was being summoned by Treasury Secretary Jacob J. Lew to explain why he refused to compromise. Banks and lawmakers, as well as financial regulators from around the world, had besieged Lew with complaints about Gensler’s campaign to impose U.S. rules overseas. The July 3 meeting in Lew’s conference room with a view of the White House grew tense, according to three people briefed on it. Gensler argued his plan was vital if the U.S. hoped to seize meaningful authority over financial instruments that helped push the global economy to the brink in 2008, taking down American International Group Inc. (AIG) and Lehman Brothers Holdings Inc. and igniting the worst recession since the 1930s. Lew insisted that Gensler coordinate better with the Securities and Exchange Commission, whose new chairman, Mary Jo White, was also present. Gensler, who was deep into negotiations with his European counterparts, was surprised by Lew’s demand. He’d been hearing the same request from lobbyists seeking to slow the process, and he told the Treasury chief it felt like his adversary bankers were in the room, the people said. The most obvious reminder of the Geithner-Lew continuity was the recent upending of what would have been Gary Gensler’s final and most triumphant act at the Commodity Futures Trading Commission. Gensler was trying to finish off the cross-border derivatives rule from Dodd-Frank, which would have given CFTC oversight of any affiliates which execute more than $8 billion in trades, no matter where the location of the entity. This would have arrested a race to the bottom, where the mega-banks that control 95% of all trades fan out overseas to park their trading desks away from CFTC oversight. Facebook Determining Your Credit Score? It's not what you know but who you know? The insanity of online media is knowing no bounds. There is something strange about the mighty giant of cell phones, Nokia, being bought up for chump change. This story has an interesting graphic showing the timeline of disaster. Most interesting the executive behind the Nokia loss of market share is an ex-Microsoft employee. He walked into Nokia, killed their OS and more importantly fired huge numbers of engineers. Needless to say market share and the stock price plunged and now this same guy is the odds on favorite to become the next CEO of Microsoft. Funny thing considering both Nokia and Microsoft are getting their asses kicked by Google and Apple and it's their own damn fault. Could it have anything to do with power and grandiosity plus firing the engineers that these two companies are fading? One must wonder what the Finns think, after all at one point Nokia was the Finnish economy. In 2008 the Canadian province became the first North American jurisdiction to introduce a carbon tax. Now a study has found that the levy has led to a big drop in fossil-fuel consumption and greenhouse-gas emissions without hurting the economy. And, to the delight of BC's citizens, it let the provincial government cut personal and corporate tax rates. Stewart Elgie, an economist at the University of Ottawa and lead author of the report, calls it a rare win-win. Rich Narcissists? Say It Ain't So! Bill Moyers covers a round up of studies showing the rich and power are a bunch of sociopathic lites. While a host of toxic chemicals are banned in the United States, due to offshore outsourcing, they are showing up as imports in your clothes. Greenpeace did some testing and it's outright scary. Nothing better than imported toxic cotton! Today, we are exposing the links between textile manufacturing facilities using toxic chemicals and water pollution. Our investigation includes 20 global fashion brands, and testing on 141 products sold by the leading fashion brands, such as Zara, Chinese fashion label Metersbonwe, Calvin Klein, Levi's, Mango, Tommy Hilfiger and Vero Moda. We demand brands eliminate releases of hazardous chemicals into the environment and products. The best way to do this is to replace them with safer alternatives. And to show that they mean it, they must be transparent and disclose what each of their suppliers are releasing into our environment from their facilities. Female physicians in the U.S. continue to earn less than their male counterparts, with the pay gap widening during the past two decades to more than $50,000 annually in 2010, researchers said. Women doctors had a median annual income of $165,278 from 2006 to 2010, compared with yearly earnings of $221,297 for male physicians, according to the report published today in JAMA Internal Medicine. While the annual pay for women doctors has increased since the median of $134,995 in 1990, it’s only now beginning to approach the $168,795 annually earned by men 20 years ago, the researchers found. The number of female doctors has soared since Title IX of the U.S. Civil Rights Act was enacted almost 40 years ago, with women now accounting for one-third of all doctors and half of medical school students. Considering sharing with the rest of the class and leave your outrageous economic finds in the comments. News which makes your hair curl means by now most of America has one bad permanent hair job. yes you read that right, this is a local CT story that i'm surprised hasn't gotten more media attention. And i was told the recession was over, go figure...! It is just so common it doesn't make the major press. Then, most press is fiction, they try to push either lobbyist stories or "feel good" stories as if the exception they dug out is the actual norm. It is not. yeah i mean the story got a little local coverage but I could not find mention of it anywhere else. I guess i have seen reports of job fairs having hundreds of applicants but a fast food pizza chain...!!! It just blew my mind. This in the city that is home to Yale University, the institution which mints so many of our elite political and business leaders. The thing about CT is it had such a long history of being a robust manufacturing state. Even into the early '80's. As far as I'm concerned this represents a depression economy. I'm aware CT's economy is worse than perhaps all the other states but since I live here, it's a depression, not a recession.